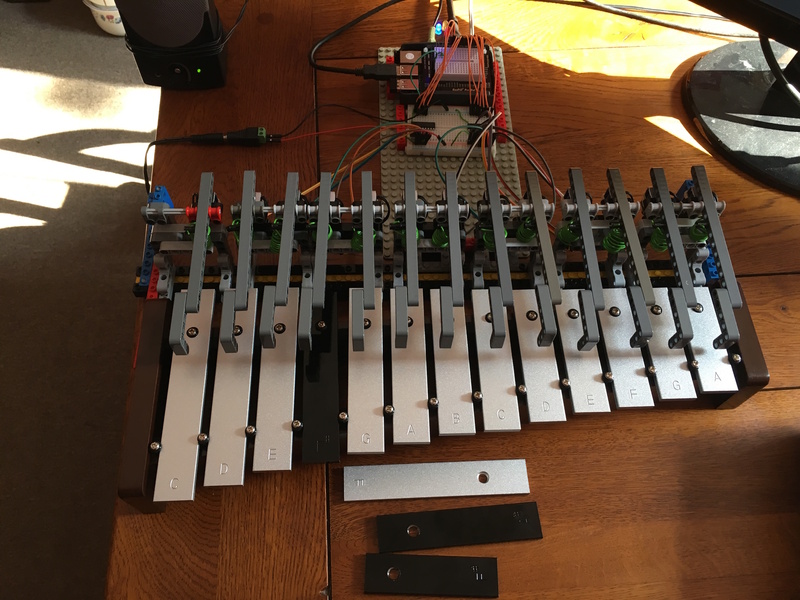 This version uses overhead hammers, and is more adaptable to work with a wider range of Glockenspiels. I set it up with a Plus Percussion PP1130 13 note Glockenspiel, which also has the facility to change certain notes so that it can play in C major, F major or G major. The article I have written contains constructional photos full circuit and software details and a link to a video of the working system. Development of a touch sensitive keyboard for use with Sonic Pi, using Adafruit’s MPR121 12 toiuch sensitive input board with OSC support added to the software. Full article, with link to software is here. Video of project in action is here. The latest version of Sonic Pi, version 3.0 is aptly named the IO version. It adds comprehensive facilities to allow Sonic Pi to communicate with the outside world, by midi or OSC messages, and it also allows live audio feeds to be accepted by Sonic Pi, to be incorporated in the program it is playing. This article explains in detail how you can interact with LEDs and buttons connected to a Raspberry Pi GPIO pins, with Sonic Pi controlling the LEDs, and the notes that Sonic Pi plays being controlled by a push-button connected to a GPIO pin. This is just one example. I have already connected Sonic Pi to Scratch, to TouchOSC running on an iPad and to external midi keyboards and synths, as well as a Microphone input, and you can also see some of these as video on my youtube channel here Hopefully I will find time to write up some of these in these future.